The goal of the Kenan Quilters' Guild is to preserve and promote the art of quilting. 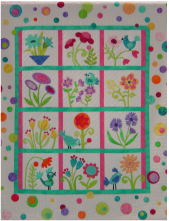 The group aims to enhance the art of quilting by sharing ideas, expertise, and fellowship among members. The Quilters' Guild supports the Kenan Center by making an Opportunity Quilt each year, presenting a biennial Quilt Show in the Kenan Arena, and presenting other quilt-related programs and events throughout the community. Meetings are held the second Thursday of the month at 7:00 p.m. in the Taylor Theater Meeting Room. Membership is $15 per year which includes a Guild newsletter. For more information, contact the Kenan Center Business Office at (716) 433-2617 or email us at kqgquiltshow@gmail.com. The Opportunity Quilt is made by members of the Kenan Quilters' Guild each year and raffled, with proceeds benefiting the Kenan Center. Our 2019 quilt is "Diamonds in the Deep." The pattern was designed by Kirsty Cleverly of Bonjour Quilts. The creation of our quilt was chaired by Nancy Smith and it was long arm quilted by Tara Thom of Town and Country Quilting. Tickets may be purchased from any member of our guild and at most Kenan Center events. The Kenan Quilters' Guild is a proud affiliate of the Kenan Center in Lockport, NY.